Whaling in Australia. Australian whaling history, whales of Eastern Australia and whale watching, Byron Bay Whaling Station, scientific whaling for research and international whaling treaties. copyright Max Egan 1995, all rights reserved. During the 1790's and early 1800's whaling ships, mainly from Britain, visited ports in New South Wales and Tasmania to unload whale products, but commercial whaling in Australia really developed during the late 1820's. Whalers obtained oil from the whales for use as lamp fuel, lubricants, candles and as a base for perfumes and soaps. Baleen was used in the 19th century in corsets, whips and umbrellas. Whaling was Australia's first primary industry. Hunting was initially carried out from small boats and the whales were towed back to a shore station for processing. The main species caught was the Southern right whale; so named because it was slow moving (making it easy to catch), and once killed, the whale would float. It was simply the "right" whale to catch. By 1845 twenty six thousand whales had been killed and by 1935 there were so few southern right whales remaining that whaling ceased and they became protected internationally. 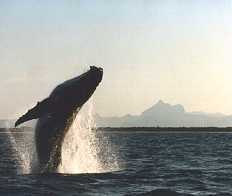 Before World War II, most hunting for humpback whales near Australia took place on the west coast and in Antarctic waters. Between 1936 and 1938 more than 12,000 humpback whales were killed. In 1939 a ten year moratorium on humpback whaling was declared to allow the numbers to increase. After the lifting of the moratorium, 18,00 whales were caught and processed (between 1949 and 1963) at Carnarvon, Point Cloates and Albany in Western Australia. The population there was reduced to about 800 whales. On the east coast of Australia, humpback whaling was initially much less intense and very few whales were taken before 1949. However, by 1956 whaling stations were operating at Norfolk Island and Moreton Island (near Brisbane) in Queensland, and at Byron Bay and Eden in New South Wales. Between 1950 and 1962 nearly 12,5000 humpbacks were killed and processed along the east coast. 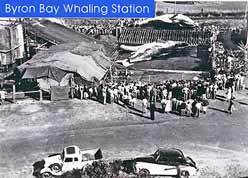 The Byron Bay whaling station operated from 1954 to 1962. During this time 1,146 whales were processed producing 10,000 tons of oil. The official whaling season each year was from the beginning of May until the end of October. The largest whale caught at Byron Bay was a female 15.9 metres long, the minimum legal length was 10.6 metres. The whaling industry had become so efficient with modern catcher ships and exploding cannon-launched harpoons, that it finally crippled itself by over exploiting the whales. The intensive whaling left many species near extinction and it is unclear whether the Blue, Fin and Right whale populations will ever recover. Australia ceased whaling in 1978 when international treaties were signed by most whaling countries. However, some of the signatories to the treaties continue to hunt whales for what they call "research" purposes. 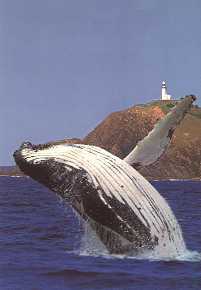 Aerial and surface surveys indicate that, from the estimated 200 to 500 humpbacks left in 1962, about 1,900 now migrate up the east coast of Australia. Humpback whale numbers are recovering slowly and now there are thought to be up to 5,000 breeding in Australian waters. Humpbacks, along with the Bowhead, Blue and Right whales, are some of the most endangered species on the earth. It is estimated that the world population in 1995 was a little over 15,000. Whale watching season runs from late June through to late September each year, when Humpback and Right whales move north from Antarctica to their winter feeding and birthing territories. Mostly you can observe whales from coastal headlands, although you can also check with local fishing and charter operators to see what offerings they have during the season. When observing whales, dolphins and other marine mammals, please follow the guidelines set out by Commonwealth Dept of Envirionment. You can also visit the Cape Byron Reserve Trust which has lot's of info. and a great view. Photo © Humpback whale with Mt Warning in background, courtesy of Paul Waters and Lance Hansen, Murwillumbah, NSW.